No Internet at my hotel in Tokyo. Or, rather, they wanted $20/day for it. Anyway, on my way home now (hanging out at the red carpet club at NRT, having free sushi, wine, and wifi). See you soon! After a struggle booking last-minute hotel in tokyo (turns out, you can’t use miles to book a hotel within 24 hrs), I went downstairs. At this point, I had about 10 minutes to check out, have the hotel guy sign my towel, and run to the train station. The man wasn’t there, but his wife (who’d done all the driving yesterday) helped me out. She took my payment (no surprise taxi charges), and grabbed the car to drive me 3 minutes to the station, then told the station attendant where I was going so he could help me get a ticket (more quickly than if I’d been on my own), and I made the train! 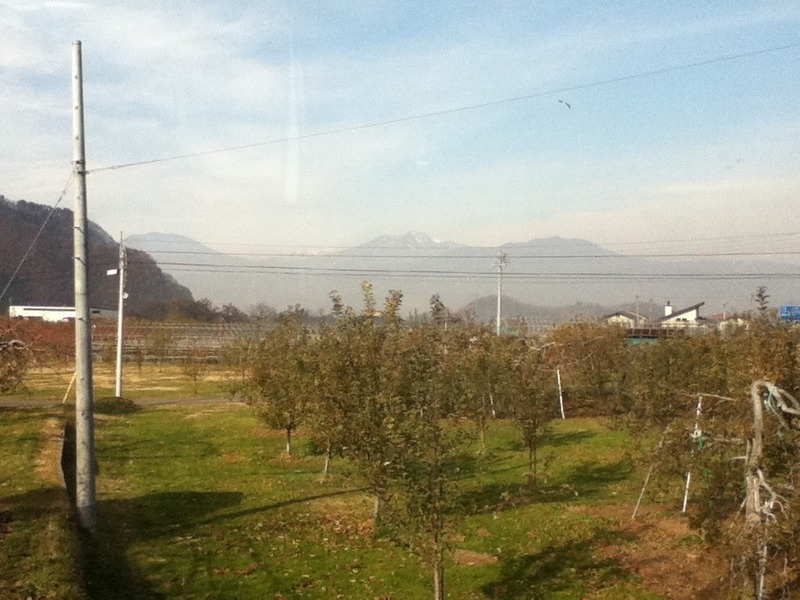 Then, in Nagano, I bought a ticket for the train leaving in 8 minutes and made that one, too. No time to buy a bento box at the station, but I got one on the train. Not bad. 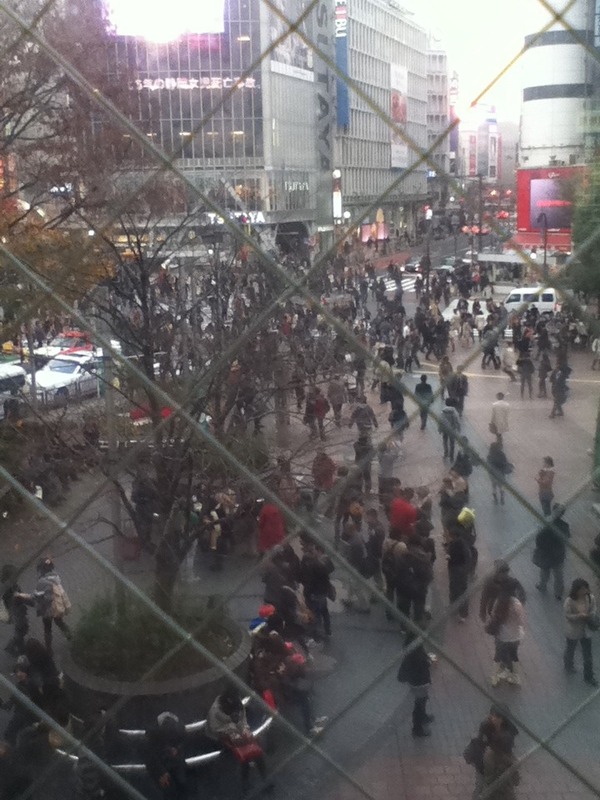 In Tokyo, I took a couple subway lines to my new hotel, checked in, and then headed out to meet Michelle. True to her word, she hooked me up with a test ride in a Tesla! One word: whee! I rode in the orange one. 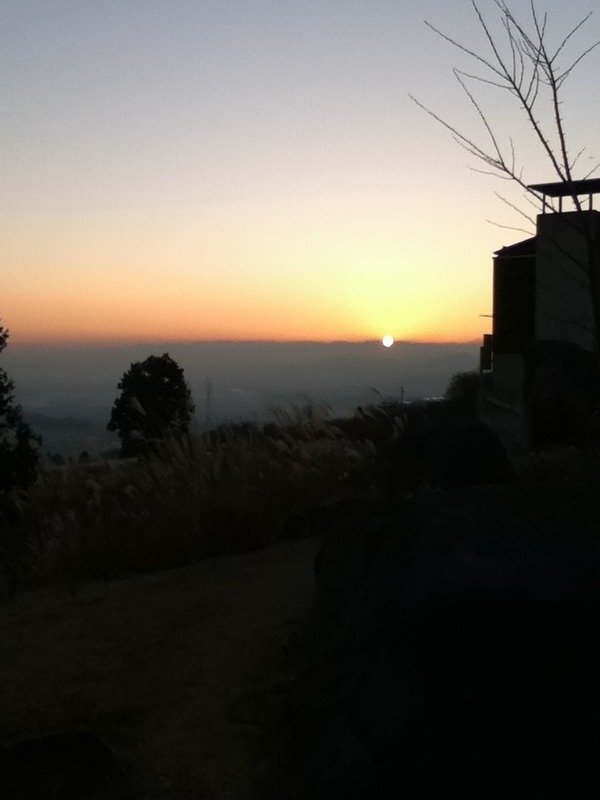 The hostess of the ryoken drove me to a public bath up on a mountain. All day, this had been the plan: leave at 4:15 to get there for sunset. 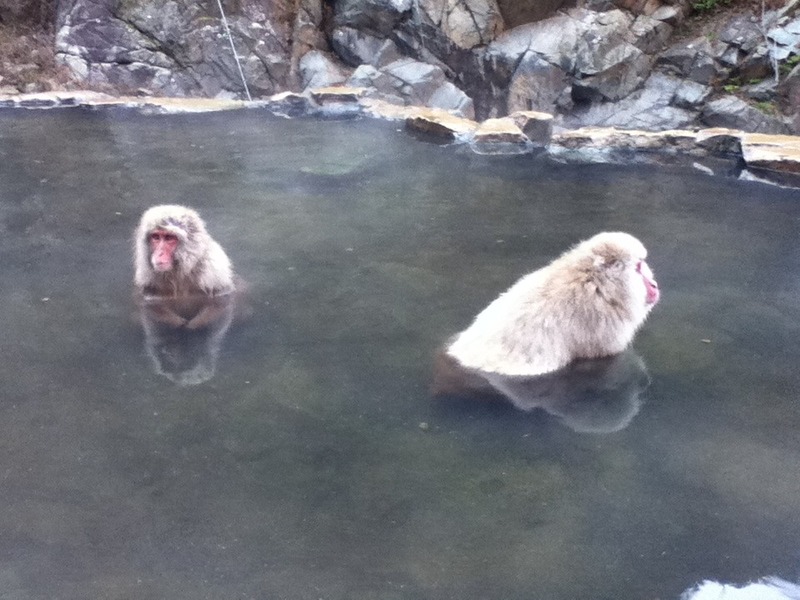 So, after monkey-viewing this morning, the Germans and I went to the shibu onsen area to wander around. Our host had been going on and on about how we should buy a souvenir towel and then stamp it at each of the 9 onsen (hot springs baths) in town. Since our hotel wasn’t in the town limits or something, we weren’t allowed to actually go in to these baths, so it seemed pretty silly to me to get a souvenir for something I hadn’t experienced. He kept re-explaining it, thinking I just didn’t get it. That said, there wasn’t anything else to do in town, and most of the shops were closed. So when one was open, and had the towels for sale…we each bought one and ran around stamping them. Sure, we were suckers, but it was something to do, it was cheap, and we figured it should make our animated host happy. He was big into scribbling on every map he saw with a red marker, and I suggested we might have him sign the towels, since his marker would match the stamps. The Germans thought this was pretty funny. Only one of the baths allowed outsiders in, and only until 4pm. But rather than go there, our hostess would pick me up and take me to this better one. The germans said it was good, so I stuck with the plan. Okay, so we get up there, and…it’s closed. Saw the view and sunset from the parking area. Would’ve been muy cool to see from the outdoor hot spring tub. Oh, well. So, back to the hotel. Hostess shows me their bath (and as I’m the only female guest, it’ll be private). But, since it’s onsite, I can go any time…and the sake/beer brewery closes at 6. The hostess kindly agreed to take me there (and stuck around long enough to confirm it was open, and arranged to pick me up in an hour). Inside was a bit of a letdown. I got the impression the lady who worked there was not happy to have me (and my lack of Japanese) there. She did the whole pretending not to hear me thing that I’ve gotten from a few women of her generation. She didn’t want to try and communicate at all. I’d been expecting some sort of tasting or to learn something about their process (the Australian in Nara had said something about their use of rice as well as hops in their beer) but there was nothing but a counter of bottles. 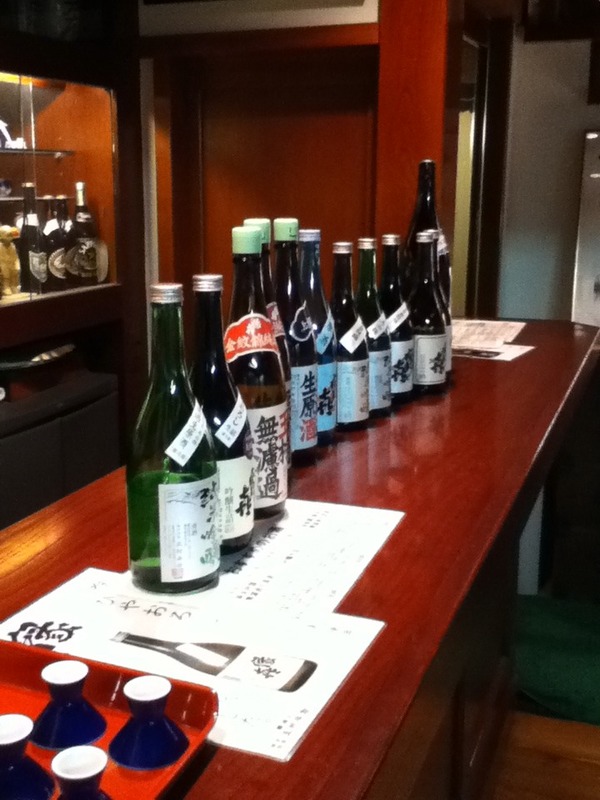 The lady poured me a taste of their beer, pointed at the sake cups, and indicated that I could pour for myself. So I did. Some I liked, some not, but I couldn’t very well ask questions. When she left and an old man took her place behind the sales counter, he seemed much friendlier. I wound up buying a small bottle of one Sake I liked to give to my hosts. They really seemed genuinely sorry that the onsen on the mountain had been closed, and they had kindly been running us around all day so we could see everything. Hopefully they won’t try and spring some surprise taxi fees on me at checkout! After I got back, the Germans and I went out for dinner. Turned out that the restaurant we were headed for was also closed. Apparently it’s some sort of holiday that shop, restaurant, and onsen people observe. We wound up having a decent dinner at the same place we’d had lunch. I did check out the bath in the hotel. It was alright, but not the cultural experience I’d been hoping for (nor the scalding temperatures I’d heard about at the mountain onsen). Afterwards, ran into the Germans in the hall. They’d been in the men’s bath, but were wearing normal western clothes and not yukatas. I should probably learn the Germans’ names. Tomorrow, back to Tokyo for a couple nights before heading home. 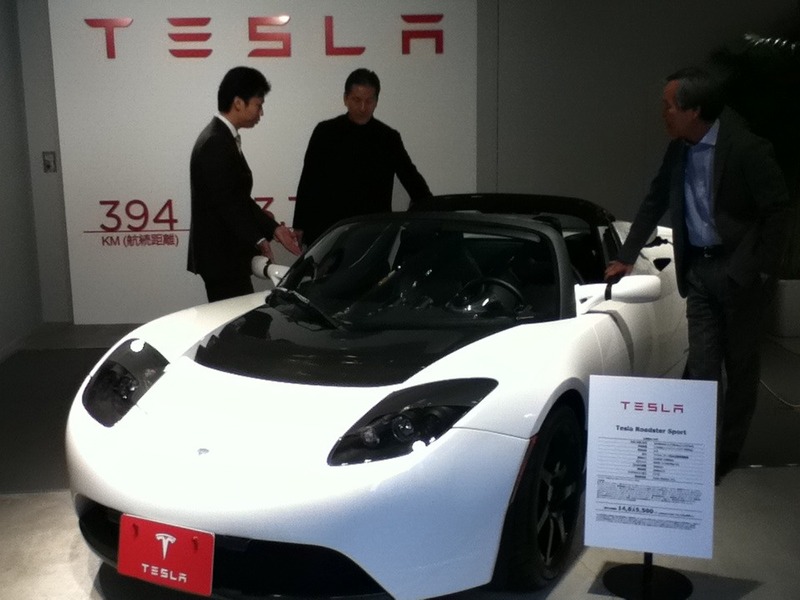 I’m bummed that Michelle wasn’t able to arrange a karaoke night out with her coworkers (they’ve been working super late every night) but I might get to see the Tesla showroom, and maybe even get to ride in one. Fingers crossed. 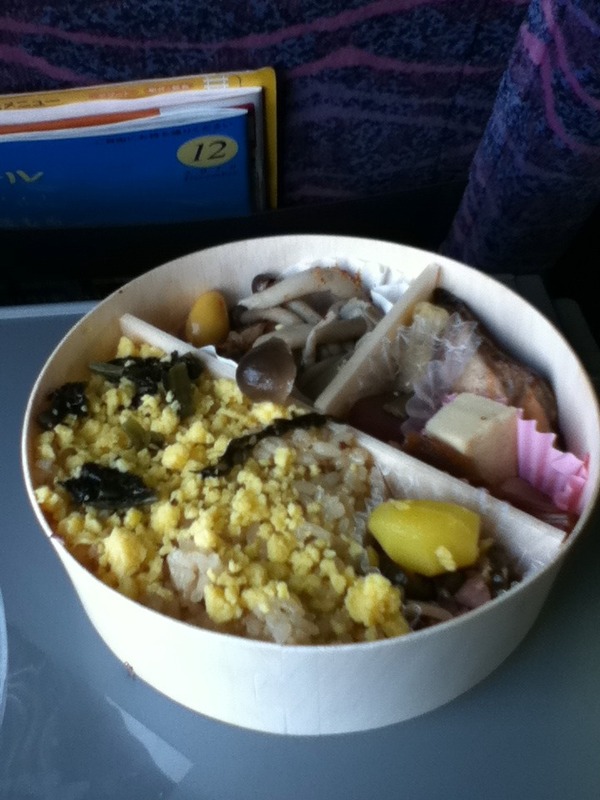 Got up on time (despite iPod battery failure overnight), took a lukewarm shower, and enjoyed a Japanese breakfast. 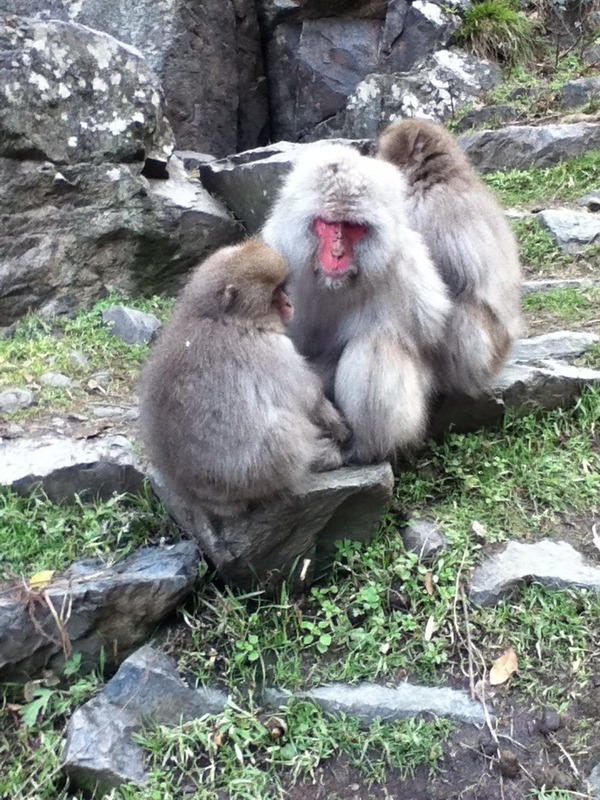 Met some germans who are staying here too, and our hosts took the 3 of us up to the entrance of the monkey park. It was about a mile up to the hot springs. And then…monkeys!